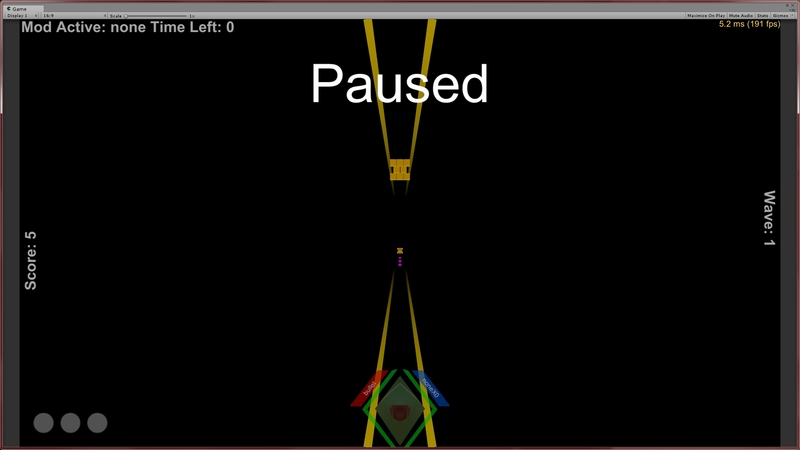 Fixed that script so now all objects respond to getting hit. Set up a system that spawns boss fights. There's only one in there at the moment though. Set up a thing that displays story text during checkpoint rounds. Needs tweaking as it currently takes up too much real estate and can obscure things on the screen. You can now pause the game. Visual feedback for objects being destroyed. I have decided to give up on trying to make a new demo for the next Demo Day in favour of releasing a new one with more robust and finished content. Particularly with some newer and more finalised art. Anyway, I've added a system to put bosses in the game, with additional art and scripts that should trigger when they appear. The first boss is pretty simple though. I added a way to pause the game and started adding some stuff for a menu to alter various options, but decided to put it on hold because I'm not sure what to add to those menus and Unity's UI stuff was giving me a headache. I've been doing some research into shaders and will probably be jumping into that type of stuff soon. I'm not sure what to tell you to expect, it's been a while since I did anything shader related, but at least my models won't look like placeholders by the time I'm done. I hope.